Three of the four nuns from the Tanacu Monastery in eastern Romania, convicted for homicide after a young woman died during what they said was an exorcism ritual, have been released from prison, Romanian Mediafax news agency reports. In 2005, the four nuns together with priest Petru Corogeanu, nailed a young woman to an improvised wooden cross in an attempt to exorcise her. The woman died. The three nuns released Saturday, Adina Lucia Cepreaga, Simona Birdanas and Elena Otel, were sentenced to five years in prison in 2007. They were released early for good behavior. The fourth nun involved, the monastery's former mother superior, Nicoleta Sofia Arcalianu, was convicted to six years in prison and is due to be released later this year. The former priest, who was sentenced to seven years in prison, will be released in spring next year. 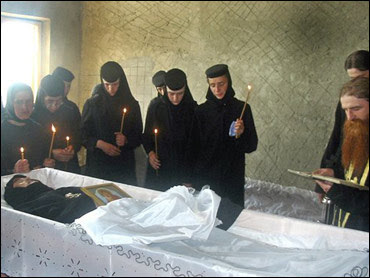 In June 2005, the priest and the four nuns nailed 23 year-old Irina Cornici to a cross in an exorcism ritual and kept her without food or water for three days. See also the 2007 documentary "For God's Sake".